You certainly want to have strong bones and osteoporosis-free. Nothing wrong if you try drinking Roselle flowers. Flowers of these plants are able to be made of different drinks, one of them is the Roselle flower tea. How to plant this flower is quite easy. 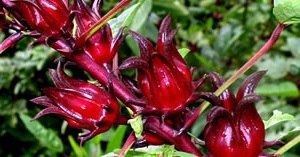 Within three months after planting, Roselle plant is could be picked and process into tea that contains some good benefits to increase stamina or for treatment. In detail, the benefits of Roselle tea can accelerate blood circulation, improve the performance of the intestine and can serve as a tonic because they contain gossypetin, anthocyanins and glycoside hibiscin that have diuretic and choleretic effects. Rosele flowers also contain high levels of vitamin C that works to improve the human immune system against disease. For people with osteoporosis, you should drink this roselle, because roselle flower contain high levels of calcium which can help reduce the risk of osteoporosis and help growth of bones. Roselle flower also contains flavonoid, which has the function as antibiotic, killing the germs that cause disease, and filter toxins in the body. The other benefits are, it has the effect of anti-hypertensive, anti-muscle cramps, anti-bacterial and helps the digestive process, preventing inflammation of the urinary tract and kidney stone formation, slowing the growth of fungi or bacteria that causes high fever. The leaves can be used as a diuretic, lowering temperatures and relief the pain. To get a medium Roselle teapot drink is easy. First, take 1-3 pieces of dry or wet Roselle flowers, then put them into a medium-size pot and then pour the hot water, it would be better if you use boiling water. Next, cover the pot and let it few minutes until the water turns red. Then add sugar according tour yo taste, you can serve it warm or cold. There are no rules for beverage consumption dose because it is purely natural. The petal number, size and number of sugar can be adjusted according to taste of consumers.